Have you ever passed by a synagogue or mosque or Buddhist temple or the church of a different denomination than yours and wondered what it’s like inside? This VR video, called “Sanctuaries”, puts you inside while explaining many interesting facts that you might not have known about the sanctuary where you yourself worship. This is a great video to assign in adult faith formation classes. This one is not for religious education classes for children. It’s fascinating for adults, and I’m sure teens can handle the level of information this VR video contains. It could turn out to be a fun project for teens who are preparing for the Sacrament of Confirmation. Please share this post with the catechists you know. My questions below could be the start of a very interesting discussion. 1. What is the meaning of “sanctuary”? 2. How is the Catholic sanctuary different from the sanctuaries of others? 3. How is it similar to other sanctuaries? 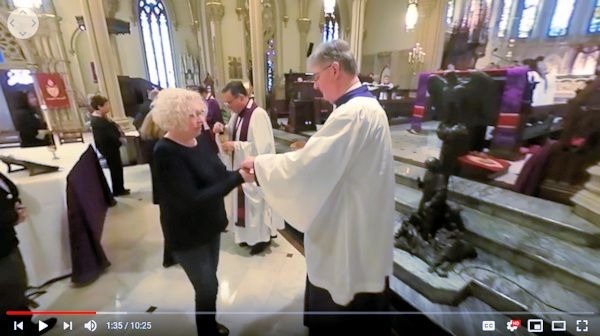 Students can make their own Virtual Reality story by shooting a panorama photo inside their own church’s sanctuary. All they need is a smart phone, a free app, and a free site to host their VR photos. I teach how easy it is in my workshop for catechists. You can download the PPT at http://catholicdr.com/vr/. This entry was posted in VR Experiences on February 2, 2019 by Terry Modica.